As a matter of equity and diversity, UH stands committed to ensuring that campus computing and information resources are accessible to disabled students, faculty and staff. On April 4, the current MyUH portal for services such as registration, grades, etc., will be retired and replaced with the new MyUH Services. The University of Hawaiʻi and Hawaiʻi National Guard successfully concluded its fourth annual Poʻoihe Cyber Security Exercise. The Information Technology Center has been awarded the Leadership in Energy and Environmental Design gold certification by the United States Green Building Council. 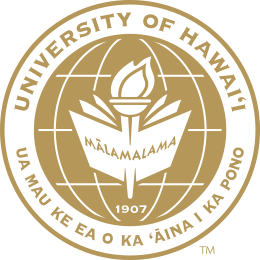 Multimillion dollar agreement with RAM Telecom International will supply transpacific fiber system capacity to the University of Hawaiʻi. David Lassner has made a $76,000 gift to support the University of Hawaiʻi System Information Technology Services. Honolulu CC to host first ever Python Programming Event and Conference in Hawaiʻi on Saturday, November 7. MyUH Services is a one-stop shop to search for online services and resources across the UH System, for students, faculty and staff. Registration is open for a two-day Intel Xeon Phi training workshop, September 14–15 at UH Mānoa. The University of Hawaiʻi has partnered with the NSA and other federal agencies to present the Anything is Possible! Careers in Intelligence Conference.